Forward Movement is excited to release a new series of infographics about Holy Week and Easter. This five-part downloadable graphic series provides a contemporary way for individuals and churches to learn more about the traditions, practices, and history of the Anglican tradition of Christianity. Downloadable PDFs can be purchased individually, or all at once with either our Discipleship Bundle for printing at your church, or the Evangelism Bundle for both printing and digital distribution across your channels. Not sure? Test it out! 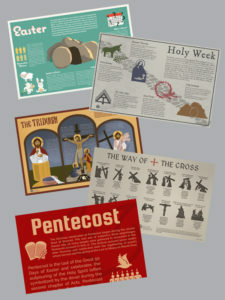 We’re giving away the Holy Week infographic for FREE through the end of April. Click here and use the promo code ONEGRAPHIC to receive this download for free through April 30 (expires at 9:00 p.m. ET).